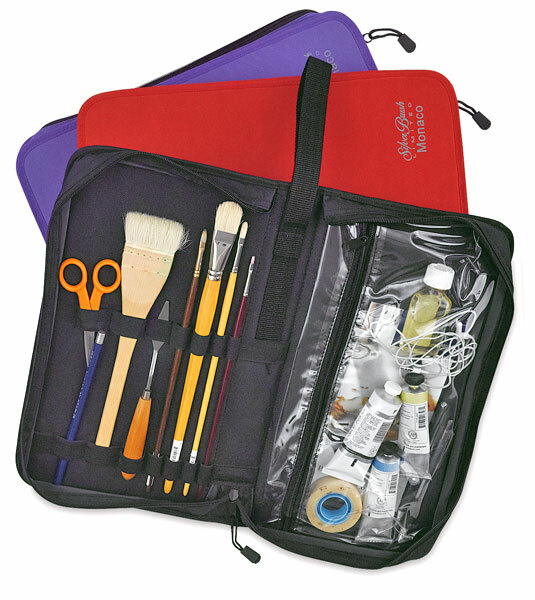 This lightweight nylon fabric case is small enough to fit into a glove compartment yet large enough to hold a variety of art supplies. There are 9 elastic multi-purpose loops to hold items in place. An inside transparent zippered pouch holds accessories, and a padded front and back offer protection. The deluxe nylon zipper zips on three sides so the case lays flat. The case slips easily into larger storage cases, making it great for travel and storage. A convenient wrist handle makes it easy to transport. ® Silver Brush is a registered trademark.™ Monaco is a trademark.